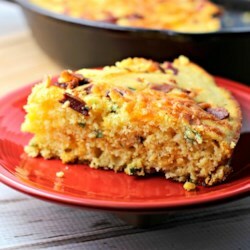 "After some trial and error, this is by far my favorite cornbread recipe. It's spicy, moist, and the cast iron skillet gives it a lovely crispy brown crust, plus bacon! Also I love that it doesn't use buttermilk because I hate buying it just for cornbread. And it's gluten-free." Place bacon in a cast iron skillet and cook over medium-high heat, turning occasionally, until evenly browned, about 10 minutes. Drain the bacon slices on paper towels, reserving bacon grease in the skillet. Spread the grease up the sides of the skillet using a paper towel. Cook jalapeno peppers in the bacon grease over medium heat until lightly browned, about 5 minutes. Combine cornmeal and skim milk together in a bowl; let sit until some of the liquid is absorbed, 5 to 10 minutes. Whisk flour, sugar, baking powder, and salt together in a separate bowl. Mix eggs and butter into cornmeal mixture; stir into flour mixture just until batter is moist. Fold jalapeno peppers, 1/2 cup pepperjack cheese, and green onions into batter. Pour batter into the cast iron skillet; crumble bacon over top and sprinkle remaining cheese over bacon. Bake in the preheated oven until set and a toothpick inserted in the center comes out clean, about 18 minutes.